This image is a mosaic of two panels, showing a colourful and dramatic group of nebulae nestled 5,000 light-years away among the densely packed star fields in Sagittarius. The view in this image covers multiple emission and reflection nebulae as well as many intricate dark structures that obscure and redden the light from thousands of distant background stars. The picturesque scene is located just west of its much brighter and more famous neighbour, the Lagoon Nebula. 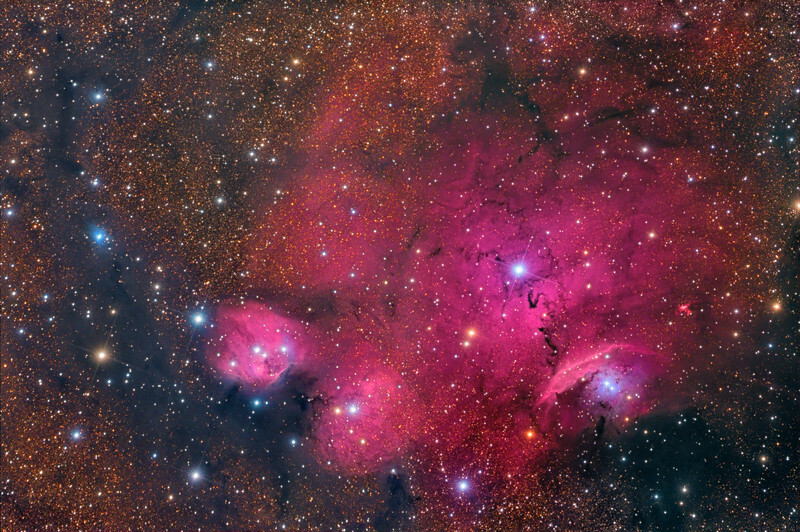 The bright magenta region that fills the majority of the right half in this image is known as IC 4685. Its broad smooth glow is broken by a starkly contrasting string of dark knots; the dark nebula Barnard 303. Near the right edge is a small intensely red Hydrogen nebula GN 18.06.6.01 and below IC 4685 lies a brighter and very colourful patch named NGC 6559. This is a combined emission and reflection nebula, where bright young stars excite surrounding Hydrogen atoms to emit a red glow, while the bright blue starlight is also reflected directly off dust particles in the cloud. Towards the bottom left are two other bright regions; the softly glowing IC 1274 and the brighter and more defined IC 1275 which is another combined emission and reflection nebula. Here the common bubble-like structure of these regions is more easily seen as it appears the central stars are eroding the nebula away by slowly forming a cavity in the surrounding gas and dust. Along the left edge of the image a long curved band of dusty dark material is blocking the light from innumerable background stars, and also framing another small blue reflection nebula IC 4684.